Nvidia Tegra K1 is built to bring console gaming to mobile devices without quality degradation. The chip which comes in 2 pin-compatible version as an upgrade from Tegra 4. Tegra K1 64-bit chip is designed for high performance single threaded and very high performance multithreaded processes. Dubbed the ‘Denver’ dual “supercore” CPU, it is based on ARMv8 while the 32-bit quad-core chip is based on ARM Cortex A15 CPU. The Tegra K1 proceeds from Nvidia’s mobile architecture which includes the Tegra 4 and Tegra 3. The change in naming comes from the fact that this new chip is based on the Kepler GPU which is part of the GeForce architecture. 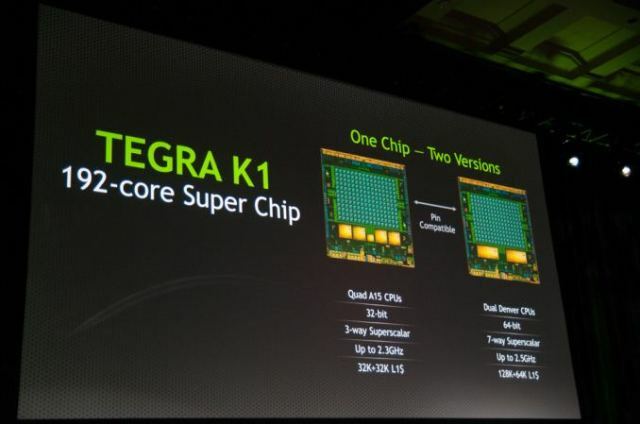 Tegra K1 features a 192-cre Kepler GPU with support for Direct X11 and OpenGPL 4.4. Project Mercury – an automotive Tegra platform is currently in testing and is aimed at delivering Nvidia chips to car infortainment and automated driver assistance systems. Car design is also targetted with the Tegra K1 Visual Computing Module which powers real time rendering of features such as customizable digital dashboards and photo-realistic rendered materials. At CES, Nvidia announced that devices based on the 32-bit Tegra K1 should arrive in the market by 1H 2014 while 64-bit devices will be seen on 2H 2014.